Sia Moz are happy to inform the news to its customers of glass mosaic designs and interior decorators, they can make any pattern of bands with the software and send us the design to buy the glass Mosaic tiles with us. Architect Nrupesh Shah, finalized the design and confirm his order of 3000 sft swimming pool tiles for his project at Bopal - guma road, resort, with blue random mix glass mosaic tiles, with application. We thank Architect and wish him all the success for his upcoming projects around Ahmedabad and Rajasthan for Glass Mosaic application. Aalya Interior new project at Gala Gardenia at Bopal Ahmedabad has come up with Stone cladding to add most creative design work. The application work is also done by our expert team. 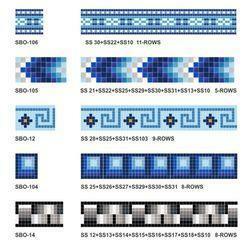 The application of fountain glass mosaic tiles is also appreciated by them. we thank the Interior Designer Ms. Shrilini for great master piece work. Pristine Mosaics happy to announce completing a prestigious project site PRANEETH, Hyderabad, with swimming pool glass mosaic tiles work. Our team member is Mr. M Muralidhara Goud is become Pearson of the month JANUARY 2018 for accomplishing and submitting this news to team PRISTINE MOSAICS. 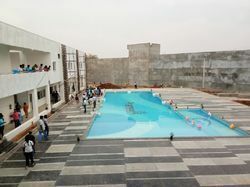 Pristine Mosaics happy to announce completing a prestigious project site Global Care Inc, Coimbatore, Tamilnadu, with swimming pool glass mosaic tiles work. Our team member is Mr. Ben john is become Pearson of the month FEBRUARY 2018 for accomplishing and submitting this news to team PRISTINE MOSAICS. 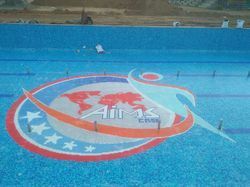 The beautiful multi-colour sports CAD MURAL glass mosaic tile swimming pool logo was created at the centre of large swimming pool.